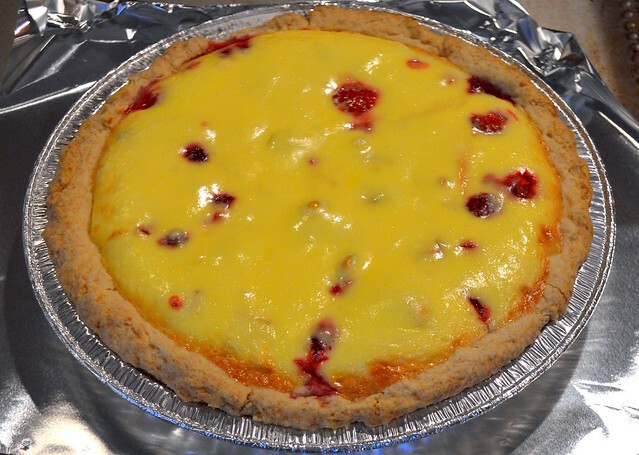 A sour cream pie made with our first raspberries! Berry pies with sour cream are quite popular back home in Finland, and very summery. Here’s my favorite recipe converted into American measurements from metric. Preheat oven to 350 F / 175 C. Cream together the butter and sugar. Add the baking powder and then flour a little at a time, mixing well in between. Add the water last. Mix gently. The crust should be a little flakey, not elastic like bread dough. Pat evenly on the sides and bottom of a 9” pie plate with well-floured hands. Spread berries evenly on the crust. The berries should fill the crust but not overcrowd it; a few gaps are fine. In a bowl, mix together the sour cream and sugar. Add egg and mix. Pour on top of berries. Place pie plate on a baking sheet lined with foil or parchment paper in case of spills. Bake for approx. 45 minutes or until slightly browned at the edges. Tastes best when cooled and keeps well in the fridge for up to a week.